Cover art by Frank R. Paul for the rare and valuable Oct. / Nov. 1939 (issue no. 1) of Marvel Comics. Ryan writes: "... enclosed is the Marvel #1 cover that I painted, reproduced using a Paul-like technique (or as close as I could get to it). This was one of the first pieces I painted in gouache, and it took forever to complete. However, I've streamlined the process, and would eventually like to do more repros of Paul's sci fi covers, like the Amazing annual. Chances are I'll never own an original Paul color cover, so I would love to match one brushstroke for brushstroke, to hang up. Hope you like this piece, and keep up the good work on the website. I check in on that site more than any other I have bookmarked." Thanks, Ryan. I'm really touched. "Marvel Comics No. 1 November 1939, Timely Publications, ... Encased within a 'Fortress' system, OWL paper of 7.5; consultant grade apparent very fine - 77. 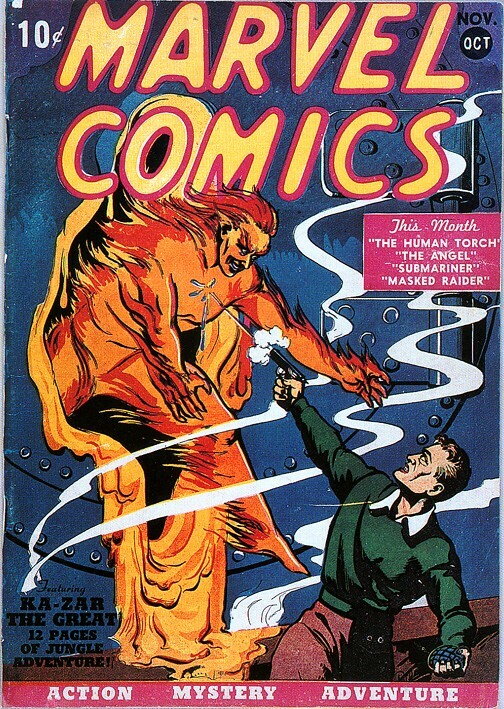 It has been three years since Sotheby's has had a copy of Marvel Comics No. 1. During this time the collecting community has come to terms with just how valuable, and rare, and important this early origin issue is. Very few copies exist in high grades, and this copy has full margins for every page on every side for the Sub-Mariner story which is quite rare - usually the Sub-Mariner story pages have the artwork running off the margins of the printed paper, or they are off placement in some other way with their printing. 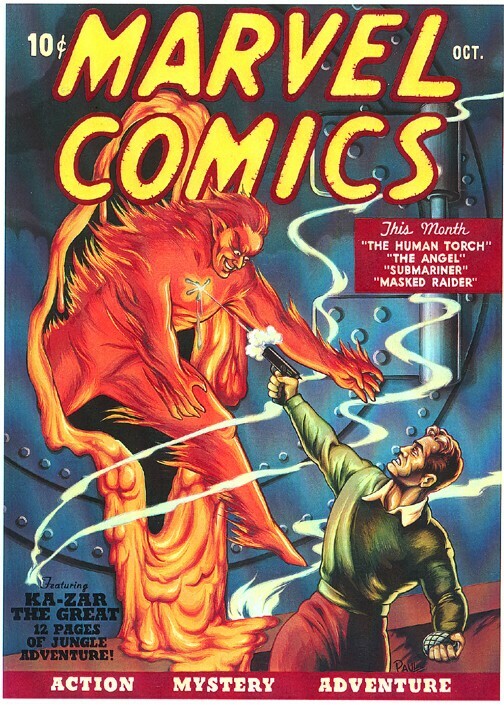 This comic features the first appearances of The Human Torch by Carl Burgos, Sub-Mariner by Bill Everett, The Angel by Paul Gustavson and Kazar, the first Tarzan clone. Frank R. Paul, famous for his magical covers for Hugo Gernsback's Amazing Stories, painted a dramatic cover for this premier issue. Overstreet states that less than 50 copies of this book are known to exist and only a handful in higher grades." The pre-auction estimate was $20,000 - 30,000. Wow. 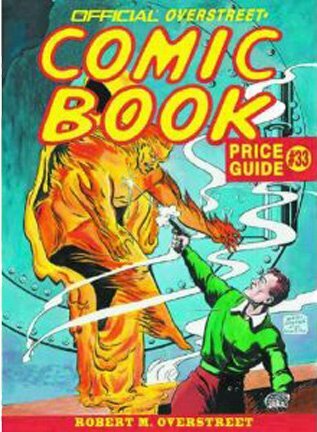 To illustrate the enduring desirability of this comic and the everlasting coolness of the Paul cover, an homage to this cover is on edition 33 of The Official Overstreet Comic Book Price Guide.